The broad stock market stays choppy but in a 10-week uptrend channel and in a short-term bullish time window until 8/13/2012. 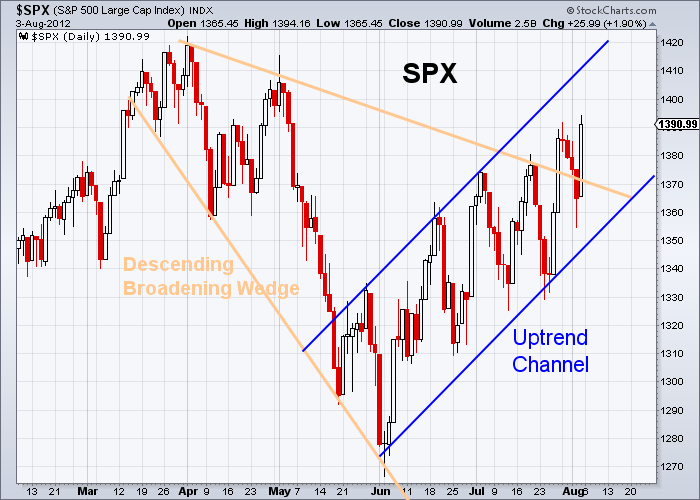 The S&P 500 index is in a 10-week Bullish uptrend channel. Also it stays above the upper boundary of the 15-week descending broadening triangle that is a very bullish sign for the SPX to advance to the level of the previous high at 1420. The Chinese stock market bounced off the 3-year low. 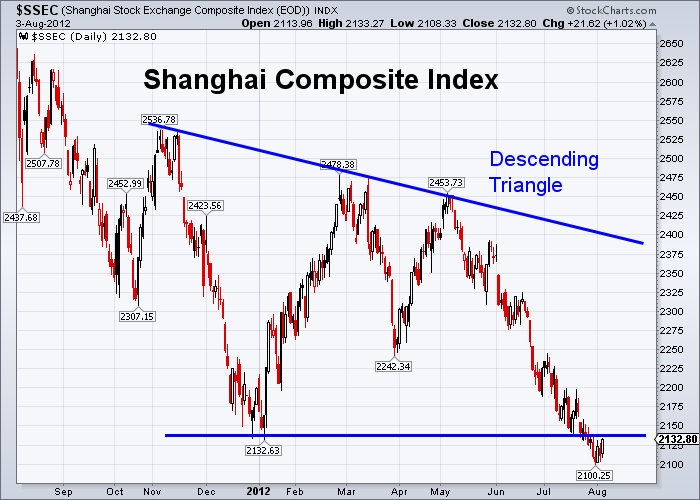 The Shanghai Composite Index may re-test the lower boundary of the 9-month Descending Triangle pattern. Descending triangles generally appear in downtrends. According to Bulkowski’s measure rule, a downside price target could be projected by measuring the widest distance in the pattern, multiplying it by 54% price target meeting rate, and subtracting it from the breakout. Therefore, the Shanghai index could fall to 2130-(2536-2130)x54%=1910, that is almost another 10% decline measured from the current level of 2130. The gold index has been in an intermediate-term Bump-and-Run Reversal Top pattern since I identified this pattern on gold in my article “How Low Can Gold Go on a Correction?” last August. 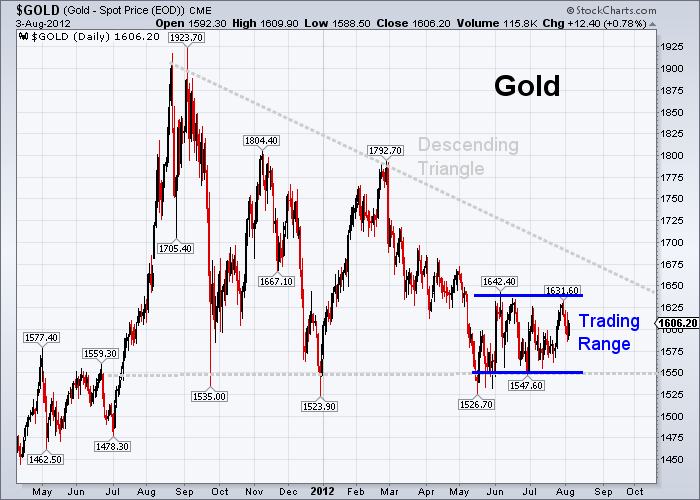 Currently the gold price is below the “Lead-in Trendline” and it is in the “Run” phase. The typical characteristics of the “Run” phase is a downhill run for price movement. 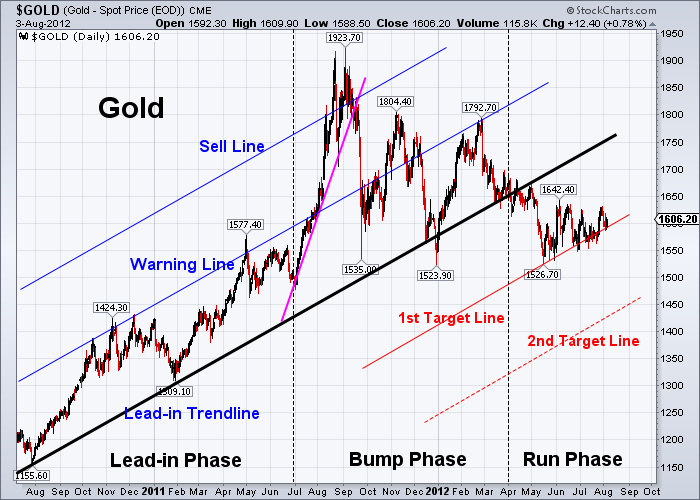 If the gold price breaks through the support of the first target line, the down price target is projected to 1420 at the second target line. Inside the 12-month Descending Triangle pattern , the gold index is forming a 10-week trading range between 1550 and 1630. Gold Prices stay choppy before a breakout from the trading range. Since April of last year, the silver index has formed a Descending Triangle pattern with a falling resistance line and a horizontal support line. It is the same like gold, it tried to rebound during last several weeks but failed to reach the upper boundary of the descending triangle, that resulted in a partial rising as a bearish sign for a downward breakout. According to Bulkowski’s measure rule, a downside price target could be projected by measuring the widest distance in the descending triangle pattern, multiplying it by 54% price target meeting rate, and subtracting it from the breakout. Therefore, if it breaks through 26.80, silver could fall to 26.80-(49.80-26.80)x54%=14.40. 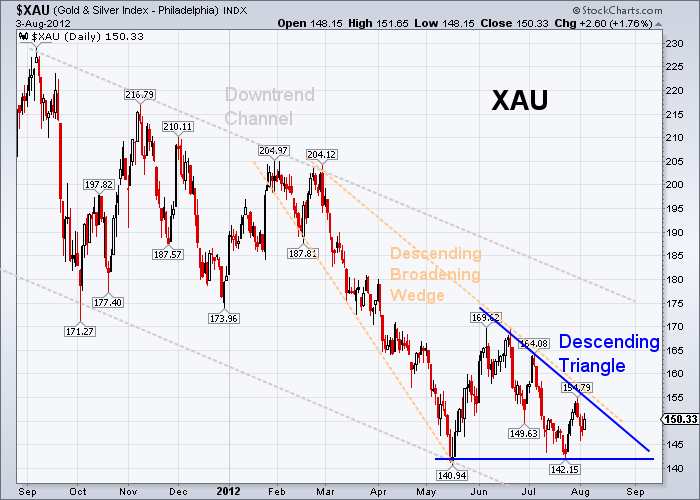 Both XAU and HUI are forming a 10-week Descending Triangle pattern. 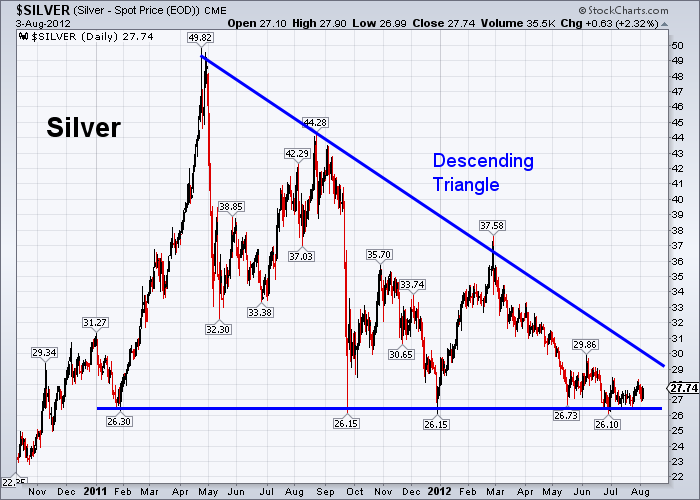 Prices should be choppy before the next breakout from the triangle. 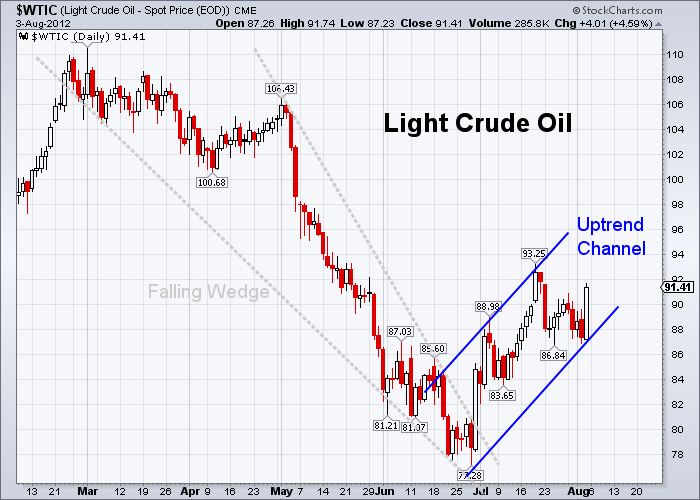 Crude oil currently is in a 5-week uptrend channel. 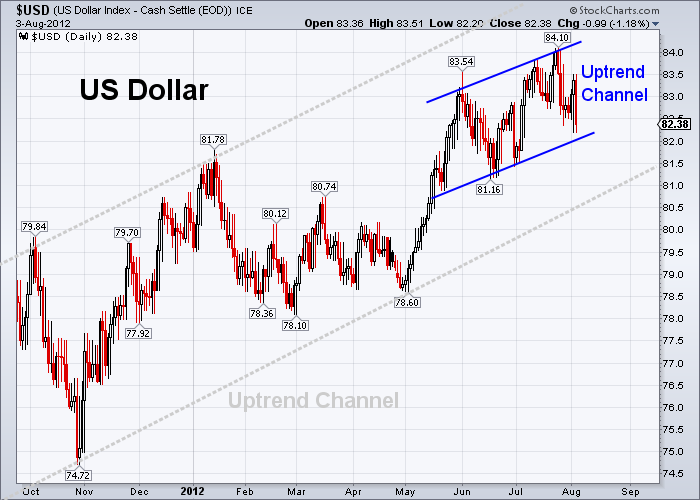 The US dollar index is forming a 2-month uptrend channel with a shallow slope. This pattern is still considered as a consolidation after the shape advance of May. Prices could be choppy inside this channel before the next breakout. 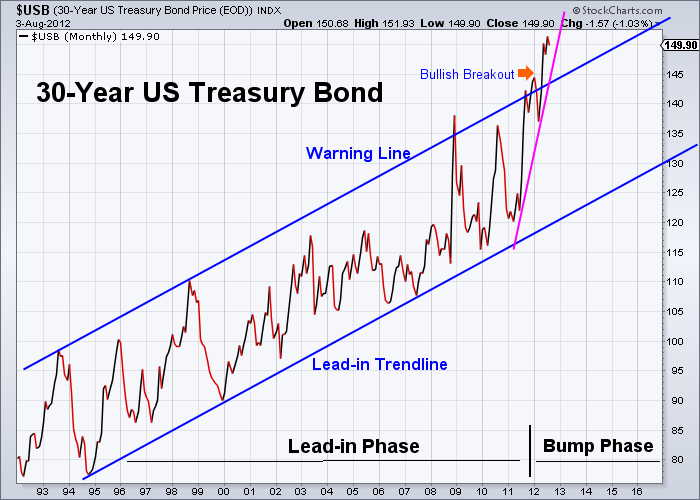 As I discussed on 6/4/2012 about “Is this a Sea-Change Signal from U.S. Treasury Bond Breakout?”, a long-term picture shows that the 30-Year US Treasury Bond had a bullish breakout from the warning line and entered into the bump phase of a possible “Bump-and-Run” formation. In the bump phase, sharp price movement could drive prices reach a bump height with at least twice the height of the lead-in uptrend channel. That means the 30-year U.S. treasury bond could reach to 172 in next several months. Fed’s extension of Operation Twist should support the current bullish trend of treasury bonds. Fast rising prices on bonds could significantly influence stock, commodity, and currency markets. 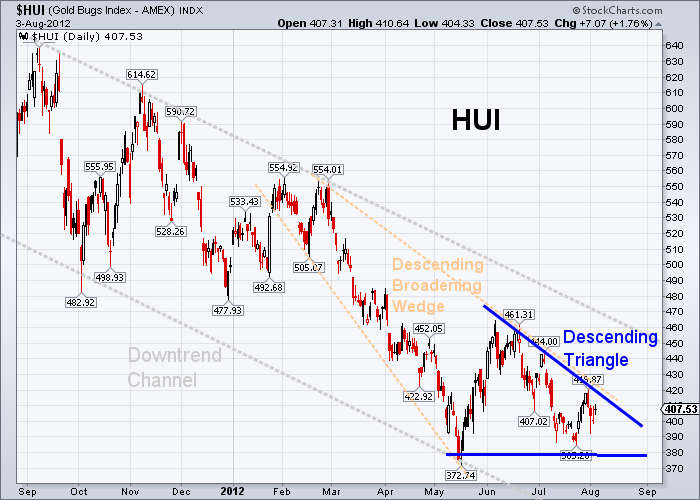 Also stocks in the utilities and real estate sectors should benefit most. We will continue monitoring the bond price against the steep-upward-sloping trendline (the pike line). The following table is the percentage change of each asset class (in ETFs) against the 89-day exponential moving average (EMA89). Currently the U.S. stock market is outperforming. Gold is underperforming. The following table is the percentage change of sectors and major market indexes against the 89-day exponential moving average (EMA89). 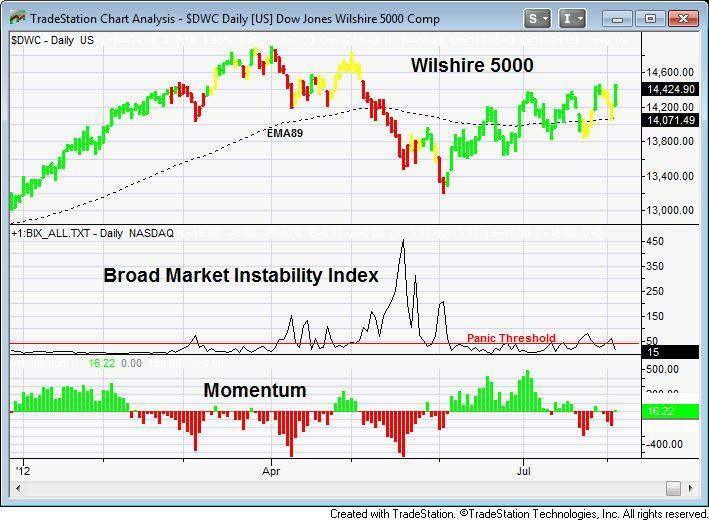 The Dow Jones Wilshire 5000 index, as an average or a benchmark of the total market, is 2.51% above the EMA89. 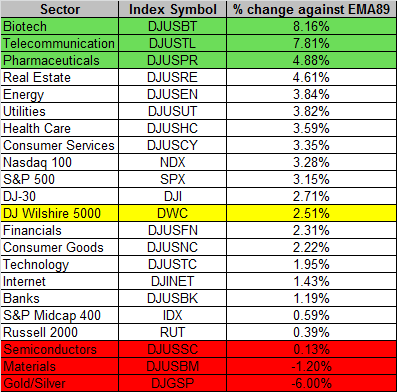 Outperforming sectors are Biotech (8.16%), Telecommunication (7.81%), and Pharmaceuticals (4.88%). Underperforming sectors are Precious Metals (-6.00%), Basic Materials (-1.20%), and Semiconductors (0.13%). The NASDAQ 100 (3.28%) is outperforming the market, and the Russell 2000 small-cap (0.39%) is underperforming. The table below is the percentage change of the BRIC stock market indexes against the 89-day exponential moving average (EMA89), also in comparison to the US market. Currently all BIRC markets are underperforming the US market.